We love Oahu, Hawaii (the island where you’ll find Honolulu and Waikiki) because it has awesome beaches and all the conveniences you’d find in a city. Koh Samui, Thailand has the same things going for it. If you want more of a backpacker island or a tents on the beach type experience, Koh Samui is not a good choice. However, if you’re traveling with parents or children, or would just like more conveniences then it’s a great choice. Since we like to spend several months at any destination, we want conveniences and features like having a wide choice of dining options and supermarkets. 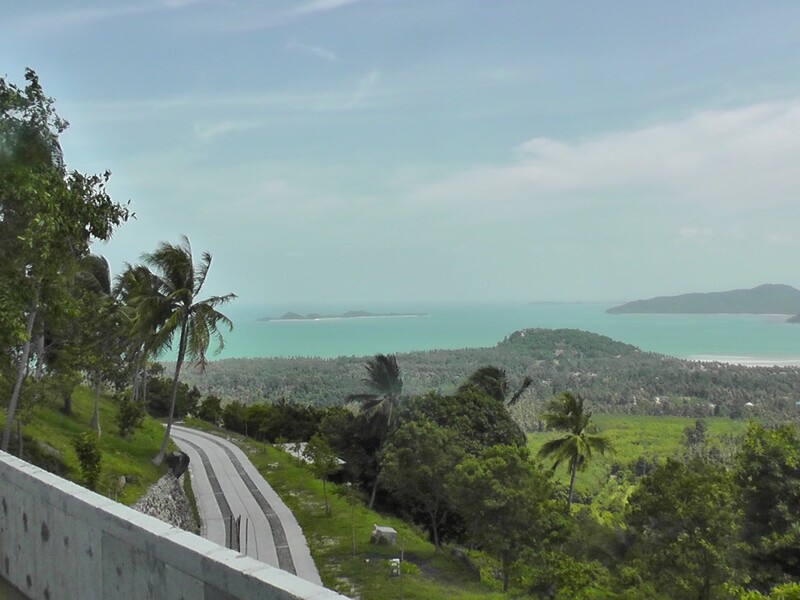 Koh Samui fits the bill, and also has Tesco Lotus, which is similar to a Target or a Wal-Mart. This is hugely helpful for buying cheap snorkels, extra beach towels and all those types of little things you end up needing. Most important tip: Avoid Dec – Feb travel to Samui due to the monsoon season. If you’re going to Thailand over Christmas, go to the West Coast islands, or the Ko Chang island group which is also fine at Christmas. 1. Take a drive around the island. Rent a car for at least part of your stay. You’ll want to get out an explore all the island has to offer. 2. Enjoy the wide variety of beaches. With Koh Samui being the largest and most popular of Thailand’s east coast islands it is not surprising that it’s best beaches are highly developed. 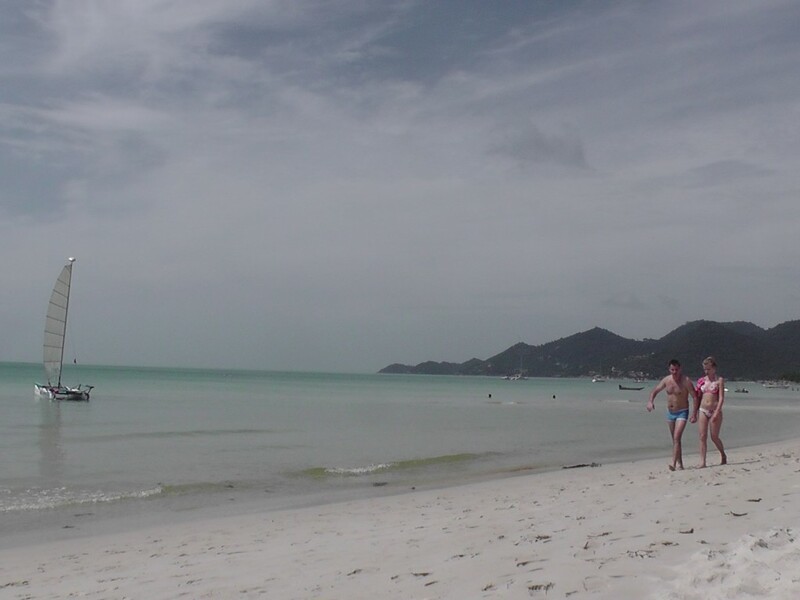 Two of it’s best beaches, Chaweng and Lamai are beautiful but busy. Chaweng has the best night life if that is what you are after. Choeng Mon Beach is a lovely safe beach for families. Mae Nam and Taling Ngam beaches are good options that are less crowded. Mae Nam is popular with backpackers but also has resort accommodation. Many people enjoy snorkelling during their holiday on Koh Samui. A popular option is to take a day trip from Koh Samui to Angthong National Marine Park or Koh Tao. It is important to do some research and choose your tour company wisely as I’ve heard some tours can be overcrowded and feel rushed. Another option for snorkelling is to hire a local boat to take you across to the near by islands of Koh Taen or Koh Matsum. For snorkelling on the mainland two popular spots are Coral Cove and Crystal Bay. 4. Relax at a yoga retreat. For some relaxation and rejuvenation spend some time at Yogarden, Fisherman’s village in Bophut. In a gorgeous garden setting you can take a pilates and/or yoga class, or have a massage. Afterwards you can nourish your body with delicious offerings at the vegan cafe. If you wish to stay, there is a wide range of accommodation options in Fisherman’s Village for people with different budgets. For an adrenaline rush and some adventure, try zip-lining above the jungle with Canopy Adventures (Samui Ring Road at Maenam Soi). Take some insect repellent and be prepared to sweat on the trek up to the 6 zip-lines, but the thrill will be worth it. Another fun activity is the explore the bays and coves of the island by sea kayak. There are plenty of places that hire them out. Make sure you wear sun protection and take a drink so you don’t get burn or dehydrated. Some people like to go elephant trekking but there seems to be considerable debate amongst tourists and animal lovers as to whether this is a cruel practice. 6. Get a little culture. Visit the Big Buddha Temple at the north-eastern end of the island. The seated golden Buddha is 12 metres high and sits atop a small island connected to the main island by a causeway. At night it is lit up and looks especially beautiful. Craving a little Thailand at home? Here’s my favorite vegan Massaman curry recipe. We went to Thailand last year and spent our last week relaxing on Koh Samui. We stayed at Lamai beach. We stayed at one of the resorts further away from the main beach part. It was close enough to walk, but we’d like to be a bit closer next time. We loved eating at the food market. We did a day trip that included snorkelling, kayaking and sight seeing. It definitely felt too rushed and next time we’ll do more research.